Alright, here's my first shot at drawing warriors (my first REAL attempt -_-) on MS Paint. 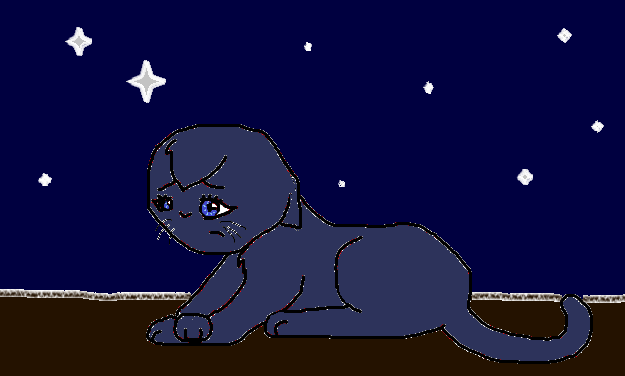 I'm reading Bluestar's Prophecy, and I'm almost finished... so I decided I would draw her. In this picture, she's supposed to be worrying about Oakheart and her future with him. The largest star represents Moonflower, while the slightly smaller one is Snowfur. :-D I loved Bluestar's Prophecy, it's my favorite of all the Warriors books. The only thing I really notice is the anatomy. It's really good for your first time, but there are still several problems. The head is a bit too big for the body, and the shoulder seems to be fused with the chest. There are other wonky bits too. Too learn better animal anatomy, I suggest looking at tutorials (there are several on DeviantART that could help). There are also some really good books out there. One of my favorites is How to Draw Animals by Jack Hamm. One thing I WOULD NOT recommend though is looking at any books or tutorials that just teach you to draw an animal in a certain pose. The best way to learn anatomy is to learn what's under the skin. Yeah, they usually don't on most animals. I always let the whites show though. Yeah, you told me that on the chatbox, Mem. And Kiwi, I already gave my reason for the "stupid hairstyle". I wasn't going to have it in the first place but it looks even stupider without it. I think what Kiwi is saying that a lot of talented artists put bangs on their cats, but she's not fond of it, and thinks they're emo bangs. xD It depends what jur doin. Its fun if your doing a comic and put hair on them to add to humanish things.. I know what she's saying. And she's said it already, but now she's acting like she genuinely hates them. Honeycloud wrote: I know what she's saying. And she's said it already, but now she's acting like she genuinely hates them. I don't hate them, I just don't like them, at all. I think they look dumb, but I'm fine with some artists using them, I just think that it makes their pictures look worse. Warriors art shouldn't make sense. XP Unless you're drawing for a bio like Kiwiifruitehh.